I represent over 50,000 voters. 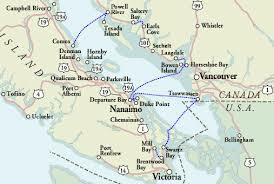 Approximately 20,000 of them are residents of Nanaimo. I also represent over 4,000 on Gabriola, fewer on Mudge and Decourcy, as well as thousands more in Cedar and Yellow Point. The Nanaimo residents and their city council are being asked to decide on the land use question of the WTE proposal, but the residents of those Islands and Cedar/Yellow Point, many of them far more directly impacted by this than are most residents of Nanaimo, deserve a say here. I aim to ensure that they are heard. I also represent Snuneymuxw people directly impacted and who have a clear right to consultation on these and all matters affecting them. My provincial role is implicated by the regulation and approval process, an provincial responsibility, as well as the obligations to first nations. 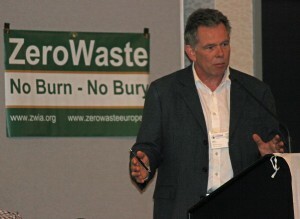 Doug Routley addressing delegates to the Zero Waste International Alliance Conference in Nanaimo on October 2, 2014. The debate over the technological and scientific merits of WTE will rage on. Across the globe, WTE seems to me to be losing that debate, with the immediate toxic consequences of emissions and legacy pollution issues around fly ash turning the tables against WTE all over the world. That debate informs the political decision of whether or not to allow WTE, but the decision, in the end, is political one of principles. It is the balancing of the information available against the values and principles of a community. It is reasonable and justified to take a position on WTE based on principles. That is what I want to address. First, the principles and ethics of Vancouver sending its trash to Nanaimo to be burned in our local air shed. If incineration is harmless and advisable, then it is everywhere. Therefore, the Lower Mainland should be willing to have the facility in their own backyard. If it is ethical and reasonable for Vancouver to refuse the facility, then it is everywhere, including the Sunshine coast and Fraser Valley, where it has been refused. It is, therefore, acceptable for Nanaimo to refuse it as well. Yes, Vancouver now sends it garbage to Cache Creek and many communities on Vancouver Island currently send off Island, as far away as the States. That does not make it any more reasonable or ethical to send Vancouver’s waste to Nanaimo. In fact, in 2010 Vancouver adopted a bylaw that forbids mass incineration within its jurisdiction. Second, we are told that since we have existing emitters, including Harmac, an immediate neighbour of the proposal, we must accept this new emitter. This is fallacy. Harmac is an existing operation, providing existing jobs that pay to support existing families and existing mortgages. Harmac has been there for many decades and, over that time, has constantly been forced to improve its operations and reduce its footprint. Its water use and emissions have been reduced in the order of 90%. The fact we have drive through restaurants and poorly running vehicles does not argue for allowing any new emitter, but rather that we do a better job controlling and reducing those inputs. Third, the effort to reduce our flow of waste has been as a result of increasing environmental consciousness and a diminished land fill capacity that confronts our near term future. That pressure has resulted in broad public education campaigns to reduce, recycle and compost. Significant public investment has been made. Private operators have invested in the process. Nanaimo was commended at the last Union of BC Municipalities conference for achieving over 70% diversion of its municipally collected waste. Vancouver, on the other hand, diverts about 50%. This, despite the fact that Vancouver has endorsed a zero waste mandate. That mandate is important to my next point. Fourth, the WTE proposal creates a commodity of waste as a fuel. Recycling and material recovery also creates a value of waste, but for reuse. The two values placed on waste will compete. The incineration option will eliminate the motive to reduce. In fact, it will become an incentive to increase the waste stream. Vancouver has a zero waste mandate and even if they get half way there from their existing 50% diversion rate, the source of “fuel” for the WTE facility will be drastically reduced. the facility, to operate at a profit in generating power, will increasingly compete for trash and, according to energy prices, will out compete recycling and composting for the waste stream. It is my belief that WTE will effectively eliminate reduction, recycling and composting efforts on Vancouver Island. Fifth, if it is truly a regional and even provincial problem and solution, then we should view it that way in its entirety. How does it make sense, provincially, to ship waste in hundreds of barges from the principle source to outlying communities? Why have one hundred barges plying Georgia Straight from Vancouver to Nanaimo when you could have one barge from Nanaimo to a facility in Vancouver? Unless you’re Seaspan, a partner in this project, and make your revenue by barging, how can that make economic or environmental sense? Sixth, our region has invested heavily in diversifying its economy. We have seen large public investment in supporting the tourism industry. One can question the wisdom of these investments but, the fact is, they have been made. From the cruise ship terminal, the convention centre to trails and parks. We have seen many significant small, medium and large private enterprises support that choice with investments in hotels, bed and breakfasts, kayaking and others. We have several local official community development plans, adopted after thorough consultations, none of which envision such a dramatic shift in focus. Seventh, this proposal and Vancouver’s gravity in the discussion of waste management in BC cries out for a regional and, in fact, provincial answer to this vexing issue. The proposed plant will cost just shy of $500 million. There may be as many as four such plants eventually proposed. Assuming they are all of similar scope, that is a capital investment of as much as $2 billion. What could BC do in terms of a truly sustainable, world leading Zero Waste plan with an investment of up to $2 billion? We could and should be global leaders in such techniques, technologies, policies and services. Such a plan would be far more diversified and offer much more employment and economic development, spread throughout the province, rather than offering massive capital concentrated opportunities to a few huge investors. We could export our expertise rather than our trash and emissions. Finally, we live in a democracy. We have the right to say yes and the right to say no. The debate over the efficacy of the technology will rage on. I believe that the principle involved provide the grounds for refusal, regardless of the outcome of that technical debate. Proponents will portray opponents as being against development and jobs. That is ridiculous. All German Shepherds are dogs, not all dogs are German Shepherds. All good, community supporting, net gain jobs are jobs. Not all jobs are good net gains for our community. I have spent 10 years as an MLA. I am constantly trying to understand the people I represent and their values. I feel that I am safely and accurately representing the vast majority of those people when I express my opposition to this proposal. All of this cries out for us to find better answers. The positive side of this proposal, is that it has sparked greater awareness of the issue of waste creation and management and has created an opportunity to achieve better results. That, finally, brings me back on topic of this page. The discussion of how to avoid WTE and achieve better solutions. That is a discussion worth having and one that will create unity of purpose rather than division. The coastal communities of BC are integral to the province’s economy. We represent one million people, all ferry dependent. Our communities contribute immensely to the economy and constitute a core element of the social and cultural identity of our beautiful province. Essentially, one quarter of the provinces population and 30% of the provincial economy depend on our coastal ferry system. This is not a simple case of small populations who are affected by decisions regarding the marine highway they depend on. The past decade has seen an ongoing and persistent mismanagement of BC Ferries that has resulted in soaring fares and falling ridership. The experiment in pseudo privatization has been an abject failure and the crisis continues to grow. The BC Liberals oversaw massive increases in management and unconscionable increases in their salaries. The bloated management ranks took home bonuses that were worth millions of dollars even as the service failed to reach its targets, lost money and saw declines in ridership of over one million passengers. On November 11th, the BC Liberals announced they were finally cancelling the rich bonuses of the executives. The next day, NDP critic, Claire Trevena, discovered the bonuses were simply rolled into the basic salaries and were, in fact, continuing. One week later, the BC Liberals announced cancelled sailings, more fare increases and cancellation of free fares for seniors. Could there be a more cynical and insulting combination of events? The BC Liberals experiment with BC Ferries has failed. It is time to abolish the Coastal Ferries Act and start over. It is time to recognize the public service mandate that originated the service and restore public interest as the core value. Washington State has a similar sized service. Their CEO earns less than 30% of the salary of BC Ferries CEO. There are far fewer managers. Ships are all built in Washington State. The service is seen as a core component of the State’s economy. And fares are a fraction of those here in BC. The BC Liberals have done no economic or social impact study to support the cuts they are proposing. The people of our coast depend on the ferries to travel to work, school, transport goods and support their businesses. There has been no analysis of the costs that will be imposed on our economies through these cuts. They have done no consultation with First Nations, local government, tourism industry or chambers of commerce. They are basing their plan on last year’s numbers while ridership has further declined, imposing an even greater loss than already acknowledged. Even these cuts will leave a large loss and increased fares will lead to even lower ridership. During this latest round of after the fact consultations and until the BC Liberal government relents in its attack on our coastal ferry services, I implore all Islanders, all coastal residents to cry out an angry rejection to these cuts. The only way such decisions are reversed is through st eady, unrelenting resistance. We fought Smart Meters for years before their installation and after. Only when the resistance was obviously never going to relent, did the government at least partially respond. As long as this government exhibits such priorities as the industry subsidization of the Northwest Transmission Line, which is some $300 million over budget, they cannot claim a lack of resources in support of our ferry service. It is about priority. It is about whether or not government acts in the public interest. These ferries are essential to the economic and social wellbeing of coastal residents and communities, every bit as much as the Northwest Transmission Line, or the roof of BC Place Stadium, or the Convention Center or Skytrain. All of these require multi-billion dollar public investments. All for the same reasons that our ferries deserve public investment that keeps pace with costs. The BC Liberals need to admit that their experiment with BC Ferries has failed, abandon their Coastal Ferries Act and accept the fact that to maintain this essential service, they must increase the public subsidy, cut management and return to a simple, transit based model. These ferries are our coastal highway. We don’t expect free service but we expect fair service. The highways and bridge investments throughout the province are paid by all British Columbians. We expect the BC Ferries system to be treated the same way. It’s only fair. Visit http://bcndpcaucus.ca/files/ferries_report.pdf to read “Washington State Ferries Fact-Finding Tour” written by Claire Trevena, MLA for North Island and Opposition Critic for Transportation and Infrastructure, BC Ferries and BC Transit. 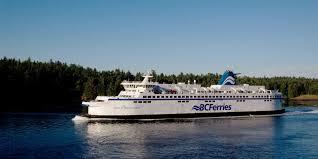 The BC Liberal experiment with the pseudo privatization of BC Ferries has been an abject failure. The Coastal Ferries Act, far from creating an accountable, efficient ferry system free of political interference has, in fact, delivered soaring fares, reduced services, skyrocketing management levels and salaries and has devastated local economies. Passed into law in 2002, the Coastal Ferries Act created a pseudo privatized corporation with one share. That share is held by the Minister of Finance. It was exempted from Freedom of Information scrutiny. For nine years, we fought in the legislature and in communities to bring ferries back under the scope of FOI. When we finally succeeded, in 2011, it was discovered that the CEO’s salary had risen to over $1 million, not including bonus’ which were being paid out in spite of losses and missed financial targets. The CEO of Washington State Ferries is paid less than 30% of their BC Ferries counterpart. Since 2002, we have seen 80-120% fare increases and massive loss of ridership. Of course, it should be no surprise that when fares skyrocket, fewer people can afford to travel. The net result is loss and the need to drive fares up even further. This has had a devastating effect on Island and Coastal ferry dependent communities. The most recent round of increases was met by a resounding expression of protest, up and down our coast. More than 100 thousand people signed petitions. Protest marches were coordinated in dozens of communities. Thousands of people attended a rally on the lawns of the legislature. All of that was of no avail to a tone deaf BC Liberal government that has long since willfully deafened itself to its citizens. The fare increases went ahead and runs were cancelled. We have, for a decade now, demanded that BC Ferries be brought back to government oversight and be funded, administered and managed as an extension of the provincial highways system. It is our coastal marine highway. We have demanded that the fleet replacement vessels be built here in BC, as Washington State Ferries must be built in Washington. We have demanded that the management ranks be reduced as they have mushroomed to the point that there is one manager to every six employees, more than 6 times the ratio in the Washington Ferries system. The UBCM commissioned a report by Larose Research and Strategy into the economic consequences of the fare increases and service reductions. The conservative findings were that the province has foregone $2.3 billion in revenue. It does not even touch on the amount of revenue that might have been added, had the fares remained reasonable. The calculations were based on a comparison of current status versus fares had they remained at inflation general levels in the years 2003 – 2013, since the Coastal Ferries Act was brought into effect. The report estimates that ridership would have increased by 13% and the additional revenues to the economy, through tourism etc., were not even a part of the $2.3 billion in lost revenue. Instead, we have seen more than a million fewer riders per year and economic decline up and down the coast. The whole province has paid for this mismanagement, in lost government revenues, and the whole province would have benefitted, had fares remained reasonable. The response by the government was to ignore those thousands of voices up and down the coast, demanding relief from high fares. Instead, to deflect attention from the chaos they have created in BC Ferries, the criticism of protesters, the unified voices of Chambers of Commerce and the UBCM report, they announced, days after the report was released and days before the UBCM convention, that they are going to fund a feasibility study for a bridge between Gabriola and Nanaimo. Rather than hear the more than one hundred thousand voices on petitions, Minister Todd Stone hears 600 from Gabriola, signatures primarily gathered during the height of anger during the protests over fare increases in November. Never mind that two OCPs have rejected a bridge, one of those signed off by the BC Liberals. Never mind that the Islands Trust mandate expressly rejects bridges. No, in a display of political arrogance rarely matched in BC political history, the BC Liberals threw a cat amongst the pigeons to create a division, conflict and crisis merely to distract from their failures with ferries. A punishment to the UBCM, of which the Islands Trust is member, for having the audacity to point out the consequences of reckless BC Liberal policy failures. As I write this, I am sitting in the Union of BC Municipalities (UBCM) convention, while they pass a resolution regarding the BC Liberal government’s mishandling of BC Ferries. The resolution before the UBCM notes that fares have reached the tipping point. It calls on the government to reverse the 2013 fare increases and service reductions and to pause any further increases until further socio-economic analysis can be undertaken. It calls for the government to recognize the coastal ferry system as an extension of the provincial highways system and to fund, administer and manage it as such. It call for government to create mechanisms to work with coastal communities to build a sustainable system that meets the needs of coastal communities and our economies. The resolution has just passed in absolute unanimity. Now it is up to this BC Liberal government to hear the demands of communities, Chambers of Commerce, citizens and First Nations and finally take material action to address the crisis at BC Ferries. Ever hopeful, but always realistic, based on their record, I won’t be holding my breath.